Kevin Patton: Okay, so thinking back when we were in college and taking all of these biology courses and human sciences courses, one of the best things was anticipating that comprehensive final at the end of the course, right? Nah, me either. Kevin Patton: As I’ve said before, I’d really like this podcast to become sort of a community of instructors that are sharing ideas with one another and to that end, I really encourage you to call our podcast line at 1-833-LIONDEN, L-I-O-N-D-E-N and record a little snippet, some technique that you found that was useful, a question that you’d like me to explore on the podcast, resource that you’d like to share, or whatever, and make sure you mention how you’d like to be identified or whether you wouldn’t like to be identified, and try to do it in a quiet environment and speak slowly and clearly, and we’ll get it on the air if we can. Kevin Patton: You can also send me an email or even if you want to record your own audio but you could just type out an email and send it to podcast@theapprofessor.org and I’ll read it on the air, and we can go from there. Anyway, let’s make this a group effort. There’s lots of things out there that I’d love to learn from you, so please do call in. Kevin Patton: I love a mystery. Whether it’s a book I’m reading or a movie I’m watching, I can almost feel the rush of dopamine as clues are uncovered and connections are made either by the characters in the book or by me as the reader and those layers of the mystery become revealed and the story starts to fit together. I think that’s why I love science and especially human science, because we’re always unraveling these mysteries. It’s really fun to read the literature and science news and listen to my colleagues who do research and who talk about these things. As the stories change, it’s so fun to get deeper and deeper into the heart of the matter, the truth of these mysteries of how the human body works. Kevin Patton: I had that feeling recently when I ran across some ideas that were published in a journal. There’s also a New York Times article that delved into the same thing, and that is having to do with our understanding of genetics, which is amazing, isn’t I, how many ideas that we’ve shifted and even almost overturned in just my lifetime, which is … Okay, it’s a pretty long lifetime but a few decades old, right, but it’s not that long really in terms of the history of science. Kevin Patton: The current thing that has me excited is the idea that I guess never really fully occurred to me but it’s one of those things that, “Well, of course, this is true,” right? That is that things that we do as humans are not only influenced by our genes but they’re also influenced by the genes of people around us, so the article called The Nature of Nurture: Effects of Parental Genotypes, and one of the points that is made by this article and by those who are discussing this article is that, yes, I’ve inherited a certain set of genes from my parents but I didn’t inherit all of those gene variants from both of my parents. It doesn’t fit right. I have about half. Some of it came from mom, some of it came from dad. The same is true for them, so my maternal and paternal grandparents passed along some things but there’s a lot that all of those people had, all of those ancestors had in terms of genetic information that I just don’t have. I didn’t directly inherit them. Kevin Patton: Some of those genetic patterns, some of those genes and group of genes have influenced me nonetheless because my parents raised me and they influenced me. Even the genes of my sibling, my brother, or the genes of other people in my life as I was growing up and probably those that are still in my life today, their genes are influencing me, sometimes, behaviorally. For example, one issue that came out in the article is the idea of education and whether there’s any genetic basis of how long a student will stay in school. Well, if there are genes for planning and forethought and so on that are very strong in the parents, then it’s very likely that the child will stay in school, not because they necessarily inherited those genes but because the parents have those genes. Kevin Patton: Looking at it from the animal world, if you have a calf who thrives and develops very well early in life and that influences many things about the rest of their life and about their biological characteristics, could it be not necessarily from genes that they inherit but also from genes for the mother and how much milk she’s producing or the quality of care that she’s giving to the calf. What we see here then is that the picture is much bigger than I was really thinking of. When I put on my genetics cap and think about genetics, I’m thinking about those gene sequences that that individual has inherited, so that’s just one more of many things that we’re learning about our genetic code recently that I think we can use to inform how we understand biology in general and how we impart that story of biology to our A&P students. Kevin Patton: Hey, thanks for listening to this episode of my podcast. I’d like to ask a favor of you. Would you take a minute or two, maybe even while you’re listening to the rest of this podcast, to go ahead and subscribe to the podcast? If you do that, that changes the search algorithms so it’ll make it a lot easier for our friends and colleagues to also find this podcast when they’re searching for it. While you’re there, why not go ahead and give it a rating and maybe a brief review because that helps with those search algorithms too? Thanks a lot. Kevin Patton: More and more, as time goes by, we’re being asked to interact with our students and even with our colleagues on a digital platform using digital tools whether we like it or not. Honestly, I kind of like it, so we have to develop a whole new set of strategies and go-to tricks and so on for doing it. I mean, how do we do it effectively when we’re used to doing it a whole different way possibly? Something I found to be incredibly useful and it seems like it might be hard but it’s really incredibly easy and that is to use short video walkthroughs for my students who are having issues with the learning management system that we’re using in the class, if they’re having issues with the Publisher provided software that we’re using in the class, if they’re having issues with anything really. I do a lot of online tests, so if they’re having some issues with the test and so on, I can help them with that. Kevin Patton: What I do when I talk about a short video walkthrough is I will use a program like Snagit or some of you may have some other program already built in, Screencastify, Jing. There are many others, many other tools like that where you basically just hit a button and it starts recording your voice and your microphone. I strongly suggest using a headset rather than using the microphone built into a keyboard or built into a webcam or something like that because it sounds like you’re inside a bucket or something when you do that but if you can separate the sound by having something going into your ear and something else going in the microphone, that works better. Kevin Patton: You narrate what you’re doing on the screen and it’s recording everything on the screen. You can say, “Okay, look. Here’s how you log in.” I’ll log in as a student, so I go in, put in my credentials, get in to whatever it is, navigate to wherever it is you want that student to go to, and do it slowly, and make sure that the cursor that you’re using is being captured. What I always do is go and set my cursor in the settings of my computer to be a pretty large cursor so they can see it when I’m doing the screen captures. I do like a three-minute recording. Then, when I’m over, I either hit save and upload it into my learning management system. I could attach it to an email. I usually don’t do that because they’re really big files and that can really mess things up. Kevin Patton: What I normally do is I just upload it to YouTube or Vimeo or there are a number of other sites that you can use and post your videos. I usually set it so that it’s unlisted, so that people searching for it aren’t going to find it but it’s not exactly password-protected either. I just email or message that URL to that video to that particular student to answer the question. That way, they can get the answer right away because I don’t know about you but most of my students get questions at 3:00 in the morning. I don’t know what kind of lives they live but they’re doing A&P stuff at 3:00 in the morning, a lot of them, or certainly, it’s going to be at a time that’s not convenient for me. Kevin Patton: I can get them immediate … Well, not necessarily immediate feedback but I can get them feedback quicker than I would normally be able to do then without them having to make an appointment with me during my office hours and come in and see me or stop by my office to see if I’m available outside of office hours. It really is a good way especially in online courses to really engage with your students because you’re missing some of that face-to-face interaction. This is not exactly a substitute for that but it does help a lot. Go to the show notes or to the episode page for this episode at our main website, theapprofessor.org, and I have a link to some other information about how to do this short video walkthrough and how that might help in your A&P class. Kevin Patton: Right now, I’d like to talk about cumulative testing. I think we all understand what the term cumulative testing means. It’s referring to a test that not only is assessing the performance over the concepts that were just learned in the previous learning module but it also tests the concepts that were learned in previous learning modules maybe even in prior courses. Honestly, I’ve always shied away from cumulative testing. The reason probably isn’t too surprising and that is I hated it as a student. It was one of my first questions of a professor when they start talking about an upcoming final exam, I’d ask, “Is it cumulative?” Of course, it almost always was. Sometimes, they use the term comprehensive final rather than cumulative final. Kevin Patton: When I became a teacher, I thought that part of my job was to make things easier for students. I now know better than that, that the easier you make it, the less learning is done. I don’t think we should make our classes hard in a sense that we’re going to put up nonsensical obstacles or be not very supportive to our students, or anything like that but we should make it hard in a sense that we really need to make them work hard because it’s only with hard work and a lot of practice that we really learn. You maybe recall some of my earlier podcasts where I talked a lot about space retrieval practice and various angles to that. If not, go back in podcast webpage. You can just got theapprofessor.org and scroll through, skim through some of those previous podcasts. Kevin Patton: Well, yeah, that’s going to cause panic and no, the students aren’t going to be prepared for that because they haven’t been practicing that. What I did a number of years ago, this is got to be over 10 years ago, I decided that I was just going to go ahead and take the leap and make all of my tests cumulative. Now, as I’ve mentioned in other podcasts, I have built a big, huge test bank that I use for online testing and so what I did was I went into test two test bank and I just added a few more items with test items from my test bank from test one. 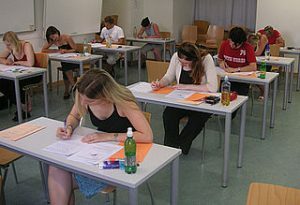 Now, test two is cumulative because I was not only asking about the concepts that I was always going to test on in test two but I was also reviewing some of the stuff, the main ideas that they had learned in the previous learning module and were tested on in test one. Kevin Patton: By the way, I was pretty selective in how I pick or which ones of the items that were in the test one test bank were chosen for the cumulative part of test two. I really wanted to focus on the big ideas, the stuff that the students really need to be walking out of my course owning. I group those into several groups at several test items and move that into test two. Then, I went into the test three test bank and do the same and I brought those items from test one that I had already selected, and then I selected some additional items from test two and make a couple of more test items. Kevin Patton: You might be thinking, “Wow, this test is getting kind of long now, isn’t it?” Well, yeah, but if you listened to my previous podcasts, you might recall that my online tests are … they are untimed, so the students can take as long as they want. If I added a few more questions, yeah, it’s going to get a little longer but it can make them work a little harder and make them work a little harder isn’t such a bad thing. Because it’s open book, it’s not unreasonably hard. It’s just more work they have to do. Really what it is, is more practice, more space retrieval practice, which was the topic of my very first podcast. You can scroll back to that if you want to listen to that again. Kevin Patton: Of course, I do that with test three, adding the material from both test one and test two, and then do that with test four, adding the material from test one, two, and three, and so on. Then, I had an in-class midterm exam and wow, they did a lot better on that midterm exam than they had done in past years. I typically had about 250 students, so comparing 250 students to the prior year’s 250 students is, I think, so much significant. To see such a large rise is pretty impressive, I think. I’ve been able to keep it up by continuing that cumulative approach. Kevin Patton: Then, we’d get to the other remaining tests of the semester after the midterm and so by the time they got to their cumulative final, they would have been practicing stuff from the very beginning and they probably know that the best. It’s only the more recent stuff that they’re a little bit weak on because even though they’ve had a lot of retrieval practice because they get more than one attempt at their online test, they haven’t had as much retrieval practice as they had had in the test one and test two material because they’d practiced that a bajillion times. Kevin Patton: I mean, they were probably just like flying through those questions on the online test and even in the in-class exam, I don’t think they really ran into any trouble with them. I know that because I watch my students as they take their tests and if I see somebody fretting over something, I will often go up to them and say, “Is everything okay? You have any questions and so on?” if I feel that will work with that student. If not, I just kind of, as I’m wandering around, I kind of take a peek at what item is it that is causing people to sweat so much. It’s never the cumulative ones because they’ve had a lot of practice doing that. Kevin Patton: That’s one way to implement this cumulative testing. It really gets back to this learning science that’s telling us that the more practice we do and the more we space out that practice and let a little forgetting creep in there in between our practices, the more effective it’s going to be for long term learning. It’s not necessarily helping us with the short term learning, which is traditionally what we’re testing, and shame on us, but it’s getting us closer to that more realistic goal, the more useful goal of the long term learning and ability to retrieve information. Kevin Patton: A couple other things I want to mention about this cumulative testing idea and that is what are some other ways we can implement it besides this little case study that I gave you on the way I did it? Well, we can do that within class test too. We can always have, let’s say five questions out of 100 or however many items you use that are cumulative and let students know that that’s going to happen. Even if in five questions, you really can’t cover all of that previous material, at least the students will know that and they’ll be at least reviewing that and maybe doing their own practice and doing their own practice questions and so on, and maybe going back to those chapters, or if they get paper tests and you let them keep them, they can go back and sort of retake those tests and so on, and do that as a way to prepare for this. It could have that effect. That would be one thing to try. Kevin Patton: You could have cumulative quizzes where some of your quizzes add … There’s always one item on your quiz that’s from a previous topic. Of course, your students are going to feel like that’s unfair and you’re being unnecessarily harsh with them but pretty soon, they’re going to learn that those are becoming easier and easier and it’s really helping them when you get to the end of … while you get to the mid-semester exam, and then finally, the final comprehensive exam. Kevin Patton: You can weave this into lab activities, even your pre-lecture, pre-lab activities and videos, especially if you flip your classroom. You can weave a lot of cumulative practice into those out of class activities that you’re doing. There’s various adaptive learning platforms out there that you might be using possibly from your textbook publisher and there are ways to assign previous topics in many of those systems. If you’re not sure how to figure that out, then get a hold of your rep or the help desk or maybe even just other colleagues that are using it. Maybe you can figure out a way to make it more cumulative than it was before. Maybe it’s already built in to have a cumulative component. Kevin Patton: Assign some homework and review assignments. Maybe even just take an occasional 10 minutes out of your classroom time every once in a while to have an activity where it’s reviewing past material, maybe a case study that involves previous concepts, or have them draw a concept map that maybe pulls in a lot of previous concepts and maybe even weaves them in and connects them up to some of the more recent concepts that you’re focusing on right around that time. Then, you can always recommend that cumulative review as a study strategy when either individuals or study groups are coming to you to get advice on how to do better on the course, so something to look into. As always, we have some links to further reading on this in the show notes and also at the episode webpage at theapprofessor.org. Aileen: The A&P Professor is hosted by Kevin Patton, professor, blogger, and textbook author in human anatomy and physiology. Minor imperfections enhance the handcrafted quality of this production.